Have you ever been to a store that sells olive oil and vinegar? Oh, I don't mean a grocery store that has a couple shelves full of oils and vinegars - mean a store that sells mostly olive oil and vinegar. Picasso's Olive Oil opened here in Longmont recently and I spend some quality time tasting and testing the various oils and vinegars. I have to tell you, I really don't need more versions of vinegar or oil. But that doesn't stop me from tasting, sampling, testing, and ... okay, well ... maybe buying. You can find a few boutique, varietal and flavored olive oils at most regular grocery stores. Specialty grocers have more variety. But this shop had a whole lot more, like wild mushroom and sage oil, or Milanese gremolata oil. And then there are the flavored balsamic vinegars. Oh my. I didn't sample everything in the store - just the vinegars and oils that were a little different from the ones I've tried before. I mean, I've used lemon, lime, garlic and basil olive oils. And I love them all. But this time around, I wanted to find some things that were different. My first interesting discovery among the oils was a butter-flavored olive oil. You know how people describe some olive oils as "buttery"? Usually that means it's smoother and milder than the oils that are fruity or spicy. This oil was more buttery than that. I decided it would be good on popcorn, or as a finishing oil on poached fish, or as a mild dipping oil for bread. Or for cooking, when I want a mild, buttery flavor. Like maybe eggs, hmmm? When started sampling vinegars, I was really smitten with the black cherry balsamic. It reminded me of a tart cherry syrup. This would be great on ice cream or over fruit or in baking or slathered on duck, pork, or chicken. Or to add depth of flavor to a fruit pie. Or, in a cocktail. Yes, I said it. Cocktail. I'm working on something now. Stay tuned for the crazy. Picasso Olive Oil is at 2055 Ken Pratt Blvd. in Longmont. You can also order online. This is NOT a sponsored post. I just happened to go there and thought it was worth writing about. Plums sometimes make an appearance in desserts, but not as often as their fruit-bowl-mates, the apple and the cherry. Plum galettes are lovely, but who wants to bake in the summer? Ice cream, on the other hand, is the perfect summer dessert. This one requires a little cooking, but it only takes a few minutes. I used dark plums with a dark red flesh. Other plums would be just as good, but the color won't be the same. The flavor of the ice cream will have people guessing. Berry? Cherry? It's definitely fruity, but since plum isn't an obvious choice for ice cream, most folks won't even think of it. Wash the plums, cut them in chunks and add them to a medium saucepan along with 1/4 cup of water. Bring to a simmer and cook until the plums are very soft. Ripe plums will take a lot less time to soften than firmer, less-ripe fruit. Continue cooking, stirring as needed and mashing the fruit, until the mixture is thick and a little syrupy. This only takes a few minutes. Let the mixture cool a bit, then pass it though a fine strainer into a medium bowl. Your goal is to have nothing left in the strainer but the skins and pits. Let this cool to room temperature, then add the sweetened condensed milk and stir until combined. Add the milk, salt, vanilla extract, and lemon juice, and stir until well combine. Cover and refrigerate this mixture until well chilled. When the mixture is chilled, churn in your ice cream maker according to the manufacturer's instructions. When it is finished churning, transfer to a storage container and freeze until firm. Plums may be my favorite fruit. If not the absolute top favorite, they are pretty close to the top. I also love the variety available, from large, dark purple plums with dark red interiors to mid-sized green plums with a pale peach-colored interior, to the small prune plums, and everything in between. For the recipes today and tomorrow I used the larger dark purple plums, and I have to say that the resulting color was stunning. the salad dressing was a bright magenta-red and the ice cream (posting tomorrow) was a lovely purple. This recipe won't scream "plum!!!" at you, but it has a lovely fruitiness that could be mistaken for raspberry, with the bright color adding to the illusion. Of course, you could use other plum varieties, but the color will be different. Wash the plum, cut it in half, and remove the pit. Cut the plum in chunks and add it to your blender along with the sherry vinegar and enough water (up to 2 tablespoons) to encourage the blender to obliterate the plum. Blend until smooth. Add the salt and oil. Blend until well combined. Taste for seasoning and add salt, if desired. Depending on how sweet or tart your plum was, you might want to add a touch of sugar if the dressing is too tart. Blend again, just to combine. 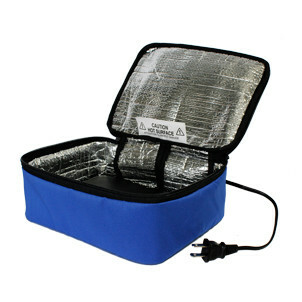 Use immediately or transfer to a storage container and refrigerate until needed. This won't completely emulsify like a traditional vinegar-and-oil dressing and will separate if not used in a short time. But that's fine - just whisk, blend, or shake to re-combine the ingredients. It's tea time again. I have to say that I'm not usually a fan of sweetened teas. Normally I drink tea unsweetened, but I decided to have some fun with the mint herbal tea that I got in my last shipment from The Republic of Tea. Nothing earthshaking, but I brewed the mint tea with two teabags in a cup of water and let it steep until it was just about room temperature. Then I tossed a tray of ice cubes into the blender, whizzed them into snow, then added the tea and a tablespoon of agave nectar. I whizzed that until it got frothy. Yes, it's essentially sweet iced mint tea, but the presentation is nice, with the froth on top. I think next time I'll chill the tea completely so the ice doesn't melt as fast. This would also be good with some fruit. Or maybe a whisper of lemon. The theme of this month's bounty of brewing was Wonder Herbs, so the three teas were from the new collection of SuperHerb teas that, according to the folks at The Republic of Tea, contain "various nutrients and antioxidants that assist in attaining peak performance, strength, longevity and can be an easy and satisfying part of a daily wellness regimen." Yeah, okay. But what do they taste like? pretty good, actually. 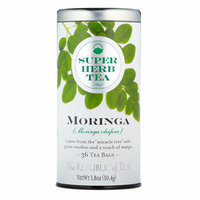 MORINGA SUPERHERB™ (Tea for Nourishment) – Known as the “miracle tree,” Moringa (mor-IN-ga) has small, vibrant leaves that have long been prized in indigenous cultures for their healing properties. We have combined moringa leaves with green rooibos, sourced from Rainforest Alliance Certified™ farms for a naturally caffeine-free blend of moringa tea. It's a mild green tea flavor, and not as bitter or astringent as some I've had. Green and refreshing is how I'd describe it. No strong flavors stand out here, so it's easy to drink. MMmmmm. Minty. I love mint teas. Baobab trees are really cool-looking. I've never seen a live one, but they look cool in photo. I didn't know the leaves were useful, so that's good to know. But, mmmm ... mint. This is my favorite of the three. 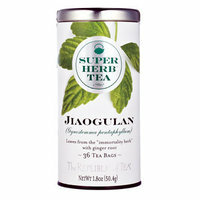 JIAOGULAN SUPERHERB™ (Tea for Stability) –A wild vine native to southern China, jiaogulan (JEE-ow-goo-lan) is described by local inhabitants as the “immortality herb.” Ancient cultures believe this adaptogenic herb, similar to ginseng, could benefit the whole body. Recognized for over a thousand years for its anti-aging, anti-anxiety and antioxidant properties, jiaogulan is thought in Chinese culture to provide unusual longevity. This fragrant, healthy cuppa of jiaogulan tea is infused with monk fruit, a celebrated natural sweetener, and a hint of spicy ginger root. Refreshing sipped hot or over ice. This wasn't as strongly gingery-spicy as some of the previous teas I've tried, which is great if you're looking for ginger flavor without as much of the spicy kick. I liked this one. Still thinking about a recipe using one of the ginger teas. Perhaps this will be the one. 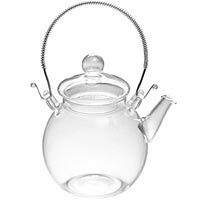 If you purchase one tin or refill bag of The Republic of Tea’s new SuperHerb™ teas between Wednesday, June 26 and Wednesday, July 3 you will receive one of their most popular glass teapots for free—the Perfect Two Cuppa Teapot (limit one per customer). Use the promo code SUPERHERB4. Isn't that little pot CUTE? 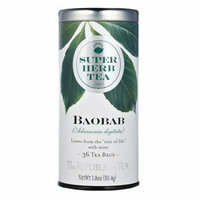 It doesn't show in the photo, but this can be used to steep whole-leaf teas right in the pot. There's a little removeable springy thing in the spout that will filter the leaves out as you pour. Also, this thing looks delicate, but it's pretty durable. I've dropped the lid three times now (I'm a klutz) and sent the teapot skidding once, and there has been no breakage. This is a sponsored post as part of my participation on the TEAm for The Republic of Tea. Okay, I'll admit it. I've developed a bit of a potato chip problem lately. So when the Top Chips kit arrived, I might have been a little over-eager to try it. Like, rip the box open, wash, dry, slice, microwave, eat. Just like that. 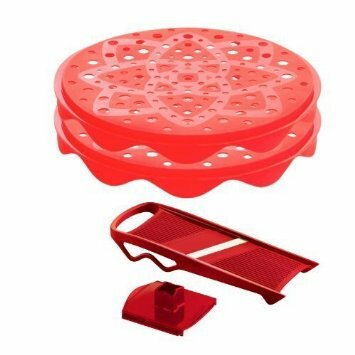 The kit ($23.95) comes with two stackable silicone trays with holes in them for ventilation, plus a small, non-adjustable mandoline that's set for the right thickness for thin potato chips. I'll admit when I was first offered this item for review, I turned it down. It looked too gimmicky. Too much like a toy. And then the potato chip addiction hit, and I said, sure, send it. The first batch I made, I followed the super-basic instructions to slice the potatoes, make sure they're dry, then arrange and microwave for about 3 minutes for 1 tray and one extra minute for a second tray, then 30 seconds longer until the chips were done. With two trays pretty well packed with potato slices (but not overlapping) it took about 5 minutes to crisp the chips and get a little browning. The chips were okay, but a teeny bit bland. The next batch I soaked in some salted water to rinse off the starch and season the chips a bit. I don't like super-salty chips, but I wanted a little more flavor. And ... perfect. I didn't miss the frying-oil flavor at all. The instructions suggest that you can make chips from carrots, mangoes, apples, sweet potatoes, and pears, besides regular old potato chips. It specifically recommends against beets and basil. I have no idea why. It it gimmicky? Yeah, a little. But I'm okay with that. What I'm not okay with is how many batches of flavored potato chips I'm likely to be making in the future. But they're fat-free, so it's okay, right? For the third post featuring peaches, I decided to do a simple smoothie. Maybe not so simple, though, with peach, banana, pineapple, and vanilla. This is great for breakfast or a snack. It's dairy-free (if that matters) and there are not additional sweeteners. This would also make a great tropical cocktail with the addition of rum or vodka. And maybe a garnish and a paper umbrella. As with the other recipes, I prefer the peaches peeled, but it's up to you. Put the ice in your blender and blitz until you have very small pieces. Peel the banana, break it into a few chunks, and add it to the blender. Peel and pit the peach and cut it into a few pieces and add it to the blender. Add the vanilla extract and salt and blend until smooth. Add as much pineapple juice as needed to get the consistency you like and blend well. In this guacamole, peaches play role similar to tomatoes - a little sweet and a little tart, and the texture is very similar to that of tomatoes. Give it a try - I think you'll like it. This pairs well with the salsa from yesterday, with the salsa providing the heat, and the guacamole taming it. Once again, I prefer to peel the peaches, but you can leave them unpeeled, if you prefer. Peel, pit, and dice the peach and add it to a small bowl. Remove the flesh from the avocado and add it to the bowl. Add the chives, lime juice, and salt. Stir to combine, breaking up the avocado as desired. Serve immediately. Garnish with some extra chives, if desired. I was drinking a glass of hibiscus tea and I thought it might make an interesting flavor for ice cream. So, of course I made some. The interesting thing was that the tea didn't infuse into the milk as quickly or efficiently as I expected. Probably because the teabags are designed so water passes through. But my milk/cream mixture was a lot thicker. Maybe it would have worked better with just the milk, since it's thinner than the cream/milk mixture. It worked well enough with a little encouragement, though. I had to squeeze and massage the teabags to get the flavor and color infused into the milk. The other choice, I suppose, would have been to open the teabags and dump the contents into the pan with the milk - and then strain the mixture through a fine strainer. It was really interesting that the mixture turned a lovely purple shade. Hibiscus tea is a reddish-magenta color when it's steeped in water. I received the tea from The Republic of Tea as part of my participation in their TEAm, but this is not one of their scheduled posts. I just happen to like hibiscus tea and decided to give this a try. Combine the cream, milk, sugar, and salt in a heavy-bottomed pan. Heat, stirring, until the sugar and salt have dissolved. Add the tea bags and bring the milk to a simmer, then turn the heat off. Squeeze the bags (kitchen tongs work well, or use a spoon to press them) until the milk is colored and flavored with the tea. Remove the teabags. If you have any hint that the bags might have broken open during the squeezing, strain the mixture through a fine strainer. Transfer the mixture to a storage container and refrigerate until fully chilled. When the mixture is cold, churn in your ice cream maker according to manufacturer's directions. Transfer to a storage container to freeze until firm. I wanted to make marshmallow ice cream before - but what flavor is marshmallow, really? I've made marshmallows, and there's not much but sugar, gelatin, and vanilla. Sugar is just sweet. Gelatin doesn't have much flavor at all. And vanilla is .. well, it's vanilla. But marshmallows have a distinct flavor. It's not just sweet vanilla. My first attempt involved using toasted marshmallows as the sugar component in ice cream. It was a really good ice cream, but I don't think anyone would have accused the ice cream of tasting like marshmallow. So ... how could I get more marshmallow flavor into the ice cream? More marshmallows didn't make sense, since I didn't want it over-sweetened. But what else tastes like marshmallows? Well, nothing really. But then I found out that there is a marshmallow flavoring. Well, okay, then. Instead of toasting the marshmallows, I threw them into the blender as-is. After blending, there were tiny bits of marshmallows remaining. An interesting thing about this ice cream is the texture. Because it went into the ice cream maker straight from the blender, it had a bit of air in it before the churning started. The finished ice cream was a little fluffy, the way a marshmallow is fluffy. Put the marshmallows and milk in the blender and blend until the marshmallows are very small bits. Add the rest of the ingredients and blend until very well blended. Or should it be a s'more sundae? You decide. Just a graham cracker, a scoop of marshmallow ice cream, and a drizzle of a fudge-y chocolate sauce. I considered dipping the graham cracker in melted chocolate and letting it harden, or making ice cream sandwiches using graham crackers, or crumbling the graham crackers and sprinkling them on top. How about an ice cream pie with graham crackers as the crust? Maybe chocolate swirled through the ice cream. Uh boy, I think I need to make more ice cream. How would you serve yours? LorAnn supplied me with a selection of flavorings to work with. I was not required to write about the product. I wanted to make toasted marshmallow ice cream, but what I ended up was a really nice vanilla ice cream with just a little bit of a toasty flavor. But that's really okay. Vanilla goes with everything, and I like a good vanilla ice cream as much as any other flavor. Put the marshmallow and the milk in your blender and blend until smooth. Add the cream, salt, and vanilla extract and blend just long enough to combine. I've heard so many people say that seafood is best "right off the boat." Those people live near coastlines. I live near mountains. Far from any coast. But the absolute next-best thing is properly prepared and frozen seafood. And in some cases, it's the best option, even if you live sorta-near a coast. I mean, fresh fish (or shellfish) doesn't stay fresh all that long, so unless you're building a bonfire on the beach to cook what was just caught, your fish is losing freshness every minute that ticks away. Bringing fresh fish home from the store and chucking it in the refrigerator to cook the next day doesn't help it one little bit. Commercial freezing technology has improved so much since the olden days when freezing was a terrible thing to do to any food. So, yeah, frozen seafood is pretty darned good these days. So when the nice folks at Bumble Bee® offered to send me a variety of their new Bumble Bee SuperFresh™ entrees, for sure I wanted to give them a try. Because not only are these properly frozen, they're complete fish recipes. Can I be brutally honest here? Fish is one of my top "I need something fast that I don't have to think about" dinners. It cooks so fast, and you can cook it from its frozen state. So no need to think about it too far in advance. The downside to using fish as my last-minute meal is that I'm not at my most creative right about then. So I grab whatever seasoning looks good, maybe some lemon. And it is what it is. It's good enough, but it's not the best I could do if I thought about it for a while. That's where these Bumble Bee SuperFresh™ entrees really shine, because the thinking part is all done. Seasoning is done. You just follow some simple directions and you have a danged good dinner. Which gives you a little time to think about a side dish or relax with a cocktail. Did I say cocktail? We'll get to that in a minute. But first a side dish that pairs well with just about any fish dish you can imagine. It's lightly lemony, freshly herby, with color and texture and vegetables. What more could you ask for? I paired it with the Spicy Shrimp Romesco for dinner. One more confession? My number one side dish with fish is rice. It's simple. I can throw it in my rice cooker. And then I have white rice to go with my seafood. It's not the prettiest plate in the world. Since I didn't have to fuss much with the entree, I whipped up a colorful pasta side using tri-color orzo and some bright vegetables. It's like edible confetti. Moscoto wine is becoming one of my favorites. It's not super-sweet, but sweet enough. I particularly like the sparkling versions. They seem so festive. And it's inexpensive enough that you can mix it with fruit juices or use it in cocktail recipes without feeling like you're ruining a fancy varietal wine. In this case, I decided to do a play off the mimosa, made with champagne. Or even a bellini, made with prosecco. The idea is the same - sparkling wine and fruit juice. The moscato wine is light and fresh and easy to drink (and perfect for summer). and the citrus is always a good match for seafood. Fill your favorite sparking-wine drinking glass about 1/4 full with juice. Top with the wine. Add the cherry, if you like. If you prefer, you can change the ratio to 50-50, or even use 3/4 juice and 1/4 wine. It's up to you. And that cherry? Completely optional. And NOW for something fishy! But you're getting no recipe. Because these entrees really are complete out of the package. The fish entrees slide into parchment bags to cook en papillote in the oven for about 20 minutes (more or less, depending on the variety) and can be served in the parchment or removed for plating. The shrimp cook in just a few minutes (about six minutes, total) on the stovetop. The funniest thing was my husband's reaction to the first entree I served - the tilapia with garlic. He was surprised when I told him that I didn't add anything at all to the fish - that it came with the seasoning and it tasted so typically like something I would make and serve - even to company. I was surprised how fresh the basil tasted when we sampled the salmon with garden pesto. I'm betting most folks wouldn't realize that it was frozen along with the fish. Really impressive. Even better, the ingredient list on the entrees are devoid of chemicals, preservatives, or things that I wouldn't have in my own pantry. Nothing scary or weird. Just normal stuff. If you're concerned about the sustainability of the fisheries your seafood comes from, the Bumble Bee SuperFresh™ seafood is certified by third-party certifying organizations. Well, okay then. The ingredients for the Spicy Shrimp Romesco are shrimp, butter, vine-ripened tomatoes, red wine vinegar, tomato powder, extra virgin olive oil, white wine, garlic, shallots, cayenne pepper, parsley, red pepper, and sea salt. See, perfectly normal stuff! It was pretty simple to cook, just toss it in a nonstick pan, turn on the heat, cook for four minutes, then drain the liquid and add the flavored butter. When the butter was melted - two minutes more - it was done. I haven't tried all of the entrees yes, but I've been really pleased with the ones I have sampled. I still have salmon with garlicky black pepper and extra virgin olive oil; tilapia with lemon, pepper, and herbs; and lemon shrimp with garlic and herbs. For sure I'll be looking for these at the local stores when I've finished them off, so I have on hand for quick and easy meals. Bumble Bee SuperFresh™ gave me free product and said they'd pay me to blog about it IF I liked it. I do! Today's event is being hosted by Kim of Cravings of a Lunatic and Jen of Juanita's Cocina. They teamed up with their blogger friends to help raise awareness and support for Cancer and Hospice today in memory of Kim's dad. We encourage everyone to read the posts and share their own experiences with cancer. We also would like to encourage everyone to donate to the Canadian Cancer Society, the American Cancer Society and also to the Canadian Hospice Palliative Care Association. Hospice was a key element during Kim's father's battle with cancer. They made it possible for Kim to care for him at home. So please show your support and donate if you can. You can also contact your local Hospice and donate directly to them if you wish. A little goes a long way! My first brush with cancer was when I was in high school, and my best friend's mom was diagnosed with breast cancer. It rocked my world. I always thought that my friend's home life was as close to Leave it to Beaver as anyone's could be. Her mom reminded of June Cleaver, with my girlfriend playing the part of a female Wally, and her little brother playing the part of Beaver. I'm not sure what part I played, but I spent a lot of time at that house, wishing I could steal my friend's mom. So when someone so ... wonderful ... got so sick, it simply didn't seem fair to me. I decided on this ice cream. It's sort-of pink, which is a cancer-awarness color. And ice cream was one of my dad's favorite treats. He didn't go crazy for cake, pie or cookies (although he wouldn't refuse them, either) but I can remember going to the store with him when pints of ice cream were on sale, or him sending me to the drugstore for two ice cream cones - one for him, and one for me. The recipe I made isn't a traditional ice cream, since it has quite a bit of yogurt in in. But it's not entirely frozen yogurt, either, because I added cream. You decide what it is. I'm just going to say it's good. Really, really good. So, this didn't start off being a planned recipe. This started off being some strawberry Greek yogurt that I wanted to use up, to make some room in the fridge. 1 1/2 cups of strawberry Greek yogurt into a measuring cup. Hmmm. Not quite enough. But that's all I had of the strawberry. I added 1/2 cup vanilla Greek yogurt. Okay, now I've got 2 cups, but that was all lowfat stuff, and I figured that I needed some fat in it or it would be too icy when it froze. So I added 1 cup of heavy cream. And I tasted it and decided I wanted it sweeter. So in went 1/2 cup of sugar, plus a generous pinch of salt. Maybe 1/2 teaspoon of the salt. Then what? Ponder, ponder ... think-think-think. Hmmmm. I was going to add vanilla, but then I remembered the vanilla rum. Or, really, it's a bottle of rum that I stuff vanilla bean pods into whenever I have a partially-used vanilla bean. It's not quite vanilla-extract strength, but it's a very-vanilla rum. Two tablespoons of the rum went in. Well, hmmm... the berry flavor was very muted. Now what? Rummage - rummage - rummage. I was thinking raspberry would be good, and I thought I had a raspberry syrup. But it was actually pomegranate. Hmmm. Maybe, maybe not. What else? I was going to paw through the extracts and see what might work. But then I remembered the bottle of Cherry Mosto Cotto syrup I had in the pantry. Hmmm. Hmmhmmmmhmm. I tasted it. Like sweetened tart pie cherries, if that makes any sense. A very deep, rich flavor. I added one tablespoon of the Mosto Cotto and tasted. Oh, yes, now we're getting somewhere. Then I added another tablespoon and tasted again and started making that om-nom-nom sound that means I've got something special going on. And then the whole shebang went into the ice cream maker. Oh yeah! Churn, baby, churn! The texture of this was nice right out of the ice cream maker and the flavor was great. Highly recommended. Since the Mosto Cotto added so much flavor, you could mess around with the yogurt flavors a bit to customize this. I'm thinking blueberry would be good. Or any fruit flavor, really. Or vanilla. You could also use a plain, unflavored Greek yogurt, but then you'd need more sugar, since the flavored yogurts tend to be sweetened. Combine everything in a suitable container and stir until the sugar is dissolved. Pour into your ice cream maker and churn according to the manufacturer's directions. 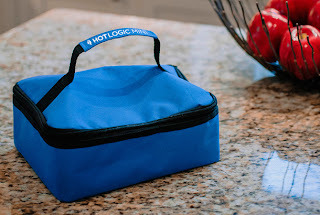 When I saw the sandwich kits that Good Cook was offering as part of the Kitchen Experts program, my first thought was the the sandwich keeper would be really handy for sandwiches for my husband's lunch. The sandwiches I make tend to be too big to fit into sandwich-sized plastic bags. And I kind of hate buying plastic bags. What really surprised me was how much I liked the little flexible plastic cutting boards. Generally, a bigger cutting board is better. But when I'm making sandwiches, I need to cut one tomato, maybe some meat, maybe some cheese. So either I'm rinsing or wiping one cutting board between each of those, or I'm putting one cutting board in the dishwasher and I'm grabbing another one. That's kind of silly. But the little plastic boards are prefect for little tasks. I can slice a tomato, slice some meat, slice some cheese, and have them all ready for sandwich assembly. And they take almost no room in the dishwasher. AND ... the colors should work well in photos, which is a plus. So, I made a sandwich. But before I made a sandwich, I made bread. Because that's how I roll. I used my bread machine, since it heats up the house a lot less than the oven. The cocoa in the bread doesn't add chocolate flavor - you'd never know it's in there. But it makes the loaf significantly darker. Rye chops is coarse-ground rye. Not as chunky as rye flakes, but chunkier than flour. Place all ingredients in your bread machine in the order recommended by the manufacturer. 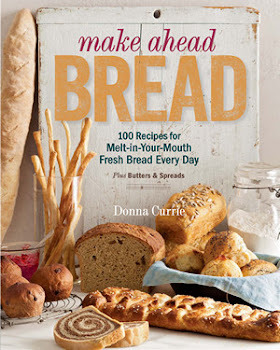 If your bread machine has setting, set for a medium loaf and a light crust. This sandwich reminds me of a picnic - chicken, cole slaw, and fresh tomatoes are pretty common picnic items. I used chicken breast that I cooked on the grill, and the cole slaw was a very simple vinegar cole slaw recipe - nothing fancy. If I had used a mayonnaise-based cole slaw, I would have left the mayonnaise off the sandwich. If you think that cole slaw on a sandwich is a little odd - well, it's not my idea. There's a very famous restaurant in Pittsburgh called Primanti Brothers that has been putting cole slaw on sandwiches for a long, long time. It adds crunch to the sandwich, along with more flavor than you'd get from a lettuce leaf. Since this is a sandwich, I'm not giving exact amounts - it's up to you how much of each item you want to stack on the sandwich. Pile it on, and have fun! One tip - make sure the cole slaw is well-drained before you put it on the sandwich, or things can get a little soggy. Check out the other sandwich recipes! You've heard of chicken under a brick, right? This is chicken under a grill press. Well, how about 1/2 chicken under a grill press? Chicken under a brick isn't so much a recipe as a technique. You cook a flattened (spatchcocked) chicken in a pan and use a heated, foil-wrapped brick to weight down the chicken. The heat of the brick helps cook the chicken on the top at the same time it's being cooked on the bottom. The weight of the brick also keeps the chicken pressed against the pan for faster and more even cooking all the way through. So I thought, well, gee, why not apply the same sort of technique to chicken on the grill? I don't happen to have bricks sitting around that I want to wrap in foil. A grill press, made from cast iron and with a handle, makes more sense, anyway. It's heavy enough to weight the chicken down, and having a handle makes handling a lot easier. You try lifting a crazy hot brick. The handle is for convenience, but isn't heat resistant, so keep that in mind. A potholder, mitt, towel, or tongs are what you need to lift the grill press once it's hot. The grill press isn't a one trick pony. It can be used when cooking bacon to keep the strips flat, if that's your preference. I'm sure there are other uses. Like keeping a cookbook open. Or ... hmmm. I'm sure I'll think of other things. As far as cooking chicken, I was thrilled with the results. The skin was crisp, and despite the fact that I overcooked the bird a little bit due to inattention, the chicken was juicy. You could certainly use this technique with a whole chicken, but I bought a rather large one and I knew that it would be more than enough for the two of us. So I only cooked half. Fire up the grill with the grill press over the fire to heat up. Rub the chicken skin with olive oil ans sprinkle with salt and pepper. I used a seasoned salt and lemon pepper, but whatever you have is fine. Place the chicken, skin-side up, on the grill and place the grill press on top of the chicken. Close the grill and cook until the chicken is done (use a meat thermometer). If you like, briefly reheat and then re-position the grill press on top of the chicken to get cross-hatched grill marks. You can cook the chicken over direct heat, or over indirect heat. On direct heat, watch for flareups. How long it will take to cook depends on the size of the chicken and how hot your grill is. My big, fat chicken should have been done in about 45-60 minutes. Let the chicken rest for about 15 minutes before you cut it apart.